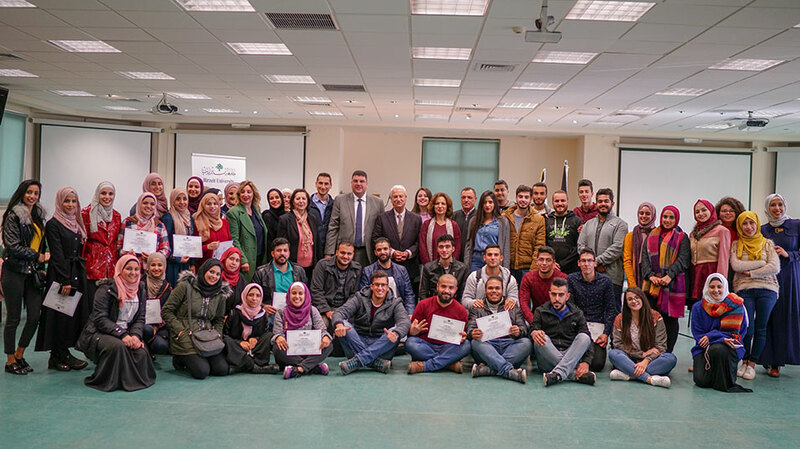 Community engagement has always been a tenet of Birzeit University’s mission as the leading higher education institution in Palestine. Whether on or off campus, the university’s students and faculty and staff members strive to develop and assist the Palestinian community. A prime example of this commitment is the university’s Voluntary Work Program, which promotes community engagement through the organization of activities and extracurricular projects and encourages initiatives and innovations aligned with societal development. 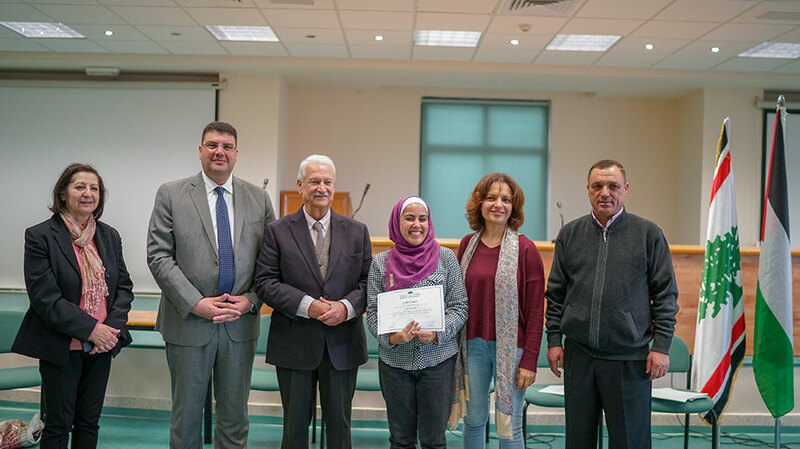 To encourage such volunteerism, Birzeit University’s Deanship of Student Affairs held a ceremony on December 1, 2018, to celebrate the extraordinary achievements of volunteering students who each finished more than 300 community work hours. Attended by President of Birzeit University Abdullatif Abuhijleh, Dean of Student Affairs Mohammad Al Ahmad, Voluntary Work Coordinator Gadah Alomare, and a number of student affairs staff members, the ceremony featured awards presented to the high-achieving students and a musical performance by members of the university’s Sanabel band. Abuhijleh, in his address to the students, emphasized the role of community engagement as one of the main pillars on which Birzeit University stands. 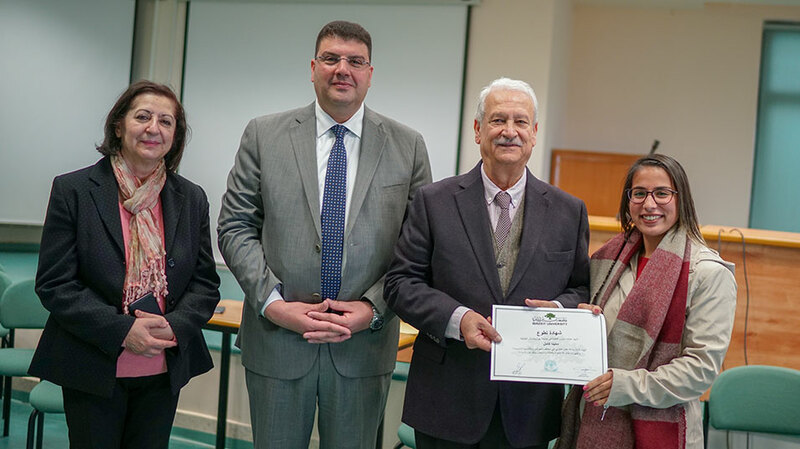 The university, he noted, serves not only to develop Palestine academically, but also socially through its Community Work Program and its 11 institutes and centers, which meet the needs of the community and bolster its connections with the university. Along similar lines, Al Ahmad commented that Birzeit University readies its students for community engagement post-graduation with its various community work programs and initiatives, such as the “Friend of the Elderly and Orphan,” “Put a Smile on the Faces of Patients,” “Support People with Disabilities,” "Friend of Each Patient,” and “Lending Used Textbooks” projects. The students - 52 in total - were awarded certificates in recognition of their outstanding community engagement efforts.